American officials are putting massive pressure on Pakistani Government to release CIA agent Raymond Davis who is arrested in murder of 2 Pakistanis in Mozang Area of Lahore City few days ago. 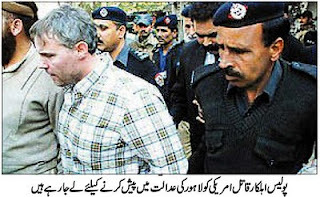 American Ambassador in Pakistan Cameron Munter met President Asif Zardari on Monday to demand release of Raymond Davis. American officials are also claiming that Raymond Davis has Diplomatic Immunity so he cannot be arrested. The Situation became more worse on Monday evening when Wife of one of the person that was killed by Raymond Davis committed Suicide by eating Poison. She said she is doing Suicide because she is not getting Justice. According to reports of Pakistani media Raymond Davis is not a Diplomat but he is a secret agent of American CIA who was spying in Lahore. Raymond Davis was also carrying Illegal Weapons and was using a Private car which is not allowed for Diplomats. Pakistanis are already very upset with America for massive Civilian Killings in American Drone attacks, its Policies in the region and how Dr Aafia Siddiqui was treated in America. If Raymond Davis is left without any proper Inquiry the hatred against America will increase even more.